Major Peter A. Lazich attended Pennsylvania State University for four years and obtained a Bachelor of Science degree in Administration of Justice in 1990.He attended the Frederick City Police Academy and successfully graduated in April of 1992. Lazich began his law enforcement career with the Washington County Sheriff’s Office in April of 1992 as a uniformed judicial deputy.In August of 1992, Lazich was transferred to the Patrol Division where he was promoted to Deputy First Class and was a D.A.R.E. instructor until October of 1994. Lazich was promoted to Corporal while in the Criminal Investigative Unit from October of 1994 to December of 2002.His duties in this position included investigations, maintaining the Property Room and conducting Computer Voice Stress Analyzer examinations. Task Force he was deputized by the Drug Enforcement Administration as a task force officer which allowed him to perform large scale multi-jurisdictional investigations. He held his position as Lieutenant at the Narcotics Task Force until March of 2007 when he was promoted to Captain – Assistant Patrol Commander of the Patrol Division. In December of 2013, he was promoted to Major – Patrol Commander of the Patrol Division. Lazich is a current board member of the 911 Emergency Numbers System Board. Captain Mark Knight is a 1982 Graduate of the Smithsburg High School and a 1984 Graduate of the Hagerstown Community College with an AA Degree in Administration of Justice. Knight began his law enforcement career in March of 1985 when he was hired with the Washington County Sheriff’s Office as a correctional deputy in the Detention Division. He graduated from the DOC Correctional Academy that same year. He transferred to the Patrol Division and graduated from the Western Maryland Police Academy in 1986. Knight made his way through the ranks and was promoted to Sergeant in 1995 and supervised his own patrol group. In 2002 he was transferred to the Criminal Investigations Unit were supervised the detectives in that unit and maintained the evidence and property room for the next 12 years. In that unit he achieved the rank of Lieutenant. In 1999 Knight attended the three week Howard County SWAT School and became a Team Leader for the newly formed Washington County Special Response Team and currently is still on the team as the Team Commander. 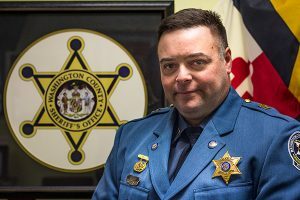 In 2008 Knight was selected as the Maryland Sheriff’s Association Deputy of the Year for Valor for his role in the 2007 incident where Smithsburg Police Officer Christopher Nicholson was killed in the line of duty. 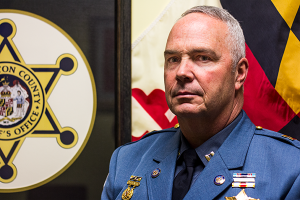 In 2013 Knight was promoted to the rank of Captain – Assistant Patrol Commander. Knight is married to his wife of Christy and has two children, Brandon and Karah. 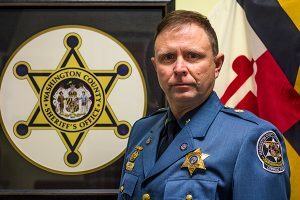 Captain Todd Kerns is a 1987 Graduate of South Hagerstown High School and a 1989 Graduate of Hagerstown Community College with an AA Degree in Administration of Justice. Additionally, Captain Kerns is a 1992 Graduate of Shippensburg University with a BS Degree in Administration of Justice. Kerns began his law enforcement career in January of 1994 when he was hired by the Washington County Sheriff’s Office. Kerns graduated from the Western Maryland Police Academy in May of 1994. He was the recipient of the Scholastic Achievement Award for the 28th Class of the Western Maryland Police Academy. Kerns made his way through the ranks of the Patrol Division being promoted to Corporal in 1999 and later Sergeant in 2005. During his time in Patrol, Kerns served as a Field Training Officer and Assistant Shift Supervisor. In 2007, Kerns transferred to the Washington County Narcotics Task Force acting as the Supervisor for the Sheriff’s Office. While at the Narcotics Task Force, Kerns served as the Director from November 2007 to January 2010 and again from January 2012 to January 2014. In 2012 Kerns was promoted to the rank of Lieutenant. In June 2014 Kerns was promoted to the rank of Captain-Investigative Services. His responsibilities include oversight for the Criminal Investigative Unit, Narcotics Task Force Agents, Digital Investigations and Forensics Unit and the Traffic Criminal Interdiction Unit. Kerns is married to his wife Kathy and has two children, Matthew and Danielle. Founded in 1986, The Washington County Narcotics Task Force is comprised of members from the Hagerstown Department of Police and the Washington County Sheriff’s Office. The NTF is responsible for the investigation, arrest, and prosecution of persons who violate the controlled dangerous substance laws of Maryland, regardless of the sophistication of the illicit operation. The office is currently staffed by fifteen personnel to include five officers from the City Police, five from the Sheriff’s Department, an Intel Analyst, one full time prosecutor from the States Attorney’s Office, one part-time prosecutor/nuisance abatement attorney, and two support staff. The NTF is housed with the Drug Enforcement Administration and the Maryland State Police at the DEA’s Hagerstown Office and works closely with Hagerstown’s Street Crime Unit. This pooling of investigative resources benefits each investigative unit with increased manpower, less duplication of effort, and by coordinating the targeting of drug offenders. Some of the NTF agents are also federally deputized members of the DEA, which gives these local agents enforcement powers anywhere in the United States. This has been very beneficial since drug violators frequently move through the tri-state area.